Mid-Market, O'Hare, EXCHANGE and More! Two months ago, the Chicagoland Chamber’s Small Business Outlook Survey showed positive trends among our region’s small businesses. Today, we are releasing a survey about Chicago’s middle market companies (firms with annual revenue between $10 million and $1 billion). The survey report can be viewed here and shows the 2017 performance and 2018 outlook of mid-market businesses in the Chicago region. It lays out another positive story. Chicago’s middle market has an outsized effect on our economy. We’re much the better for it. The middle market comprises just 1.5% of all Chicago-region companies, yet provides jobs to 26% of our private sector employees, and generates 22% of all business revenue in the region. It’s the greatest powerhouse this side of Exelon. Like all sectors and industries, the middle market faces headwinds. The strongest ones will sound familiar; they’re concerns we all have. The Chamber and its members will keep working and advocating for solutions to these challenges, while the big picture remains positive. I look forward to seeing the powerhouse of the middle market flex even more muscle going forward. 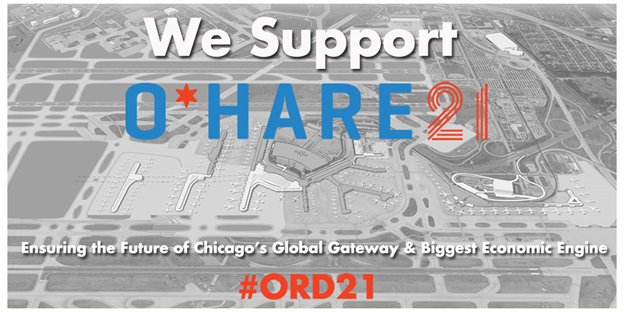 It was inspiring to see Chicago’s City Council give unanimous approval, last week, for plans to expand and modernize O’Hare International Airport. The project will create 60,000 construction jobs, add 25% gate capacity, reduce delays, create seamless international travel via the first Global Alliance Hub in the country, and profoundly improve Chicago’s long-term position in the national and global economies. A video from the Chicago Department of Aviation shows what the new O’Hare campus will look like. Register now to showcase your business at the Chicagoland Chamber of Commerce's largest networking and all-industry showcase of the year. More than 100 member showcases and 800 professionals will make the Exchange 2018 the place to do business!